Earlier this year I was really excited about the Lilly Pulitzer diffusion line for Target, and was woefully disappointed when my Target was wiped out at 8:15 a.m. and never managed to get my hands on one of the pieces on my wish list. Rather than shell out above retail prices to get a coveted shift dress on eBay, I decided to be on the lookout for a genuine Lilly Pulitzer piece secondhand. As luck would have it, I found the perfect Lilly piece to add to my closet during Coco's on the Green's half off sale. I picked up this adorable scalloped hem honey bee print skirt in perfect condition for a mere $14! Have you entered to win a piece of jewelry from Serendipity & Grace yet? Finding a genuine Lilly piece is so much better than getting anything from the Target collection! 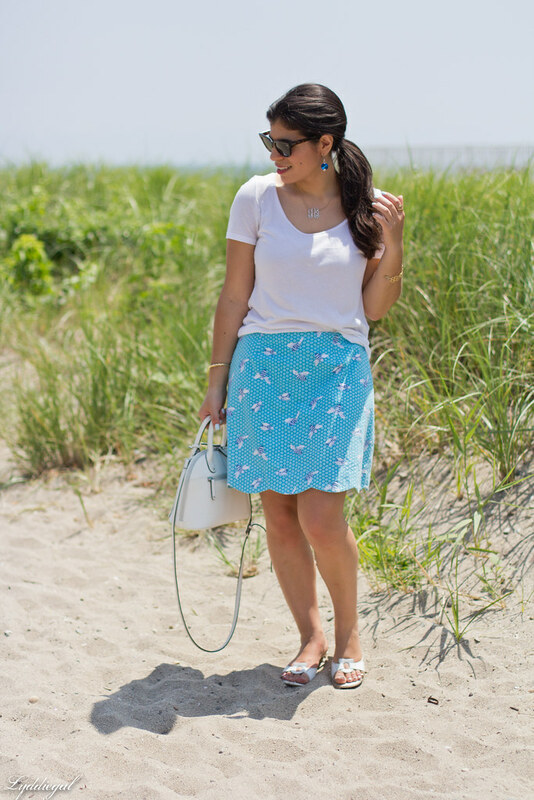 The skirt is stunning, and the scalloped hem just makes it for me - it embodies everything I think of when I think Lilly Pulitzer; femininity, fun, whimsy and, for lack of a better adjective, summer. The fact that you took these photos on the beach just makes them all the more perfect as far as I'm concerned. Love this look! Yep. And in my opinion, it's cuter! I did have a pair of Lilly for Target shorts, but was so disappointed in them I sold them for what I paid for them. I'm not a Lilly fangirl by any means, but I have two dresses. Both of which were purchased second hand, in amazing condition, and for less than these crazy markup prices on the LfT. Skirt and bracelet are great! I absolutely love that bracelet and skirt - so summer chic! What a find! I'm so glad you got your hands on a piece (and an insanely cute one at that!). This skirt is sooooo lovely on you. I adore that bracelet as well! that skirt is so pretty, love Lilly didn't even try to take part in the Target madness. Look at you go! My experience was the opposite--I happened to snag an original LP skirt right before the Target craze, so I didn't feel too badly when I missed out. Love the cute little bees on this skirt! 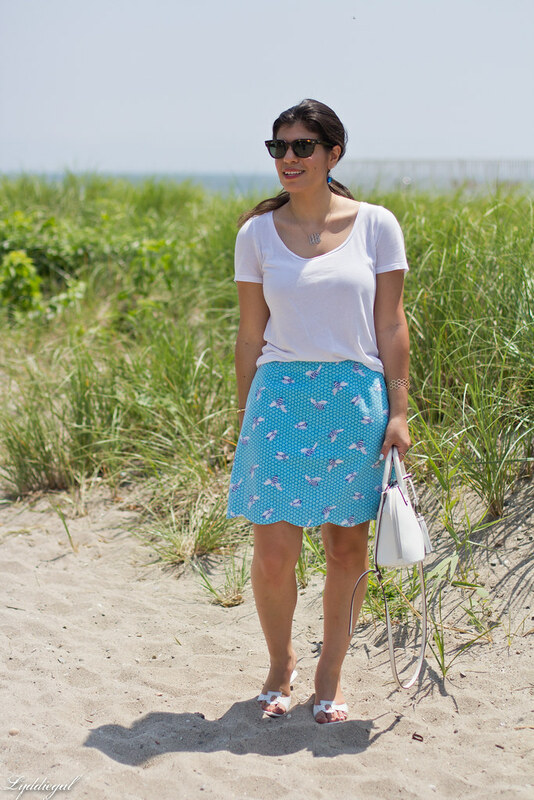 What an adorable Lilly skirt! I was lucky to snag two pieces from the Target collection but this is just as cute! I hate collaborations, they make me wait for things that I will never be able to buy. On the bright side I LOVE THE BEE PRINT SKIRT !!!! and of course scalloped ! What could be more perfect than that ? i like how you matched it to the cuff. Super cute - your bracelet matches your skirt! I'm glad you were able to find a Lilly piece without spending a fortune! I'm getting really tired of the Target collabs. I don't even bother anymore. 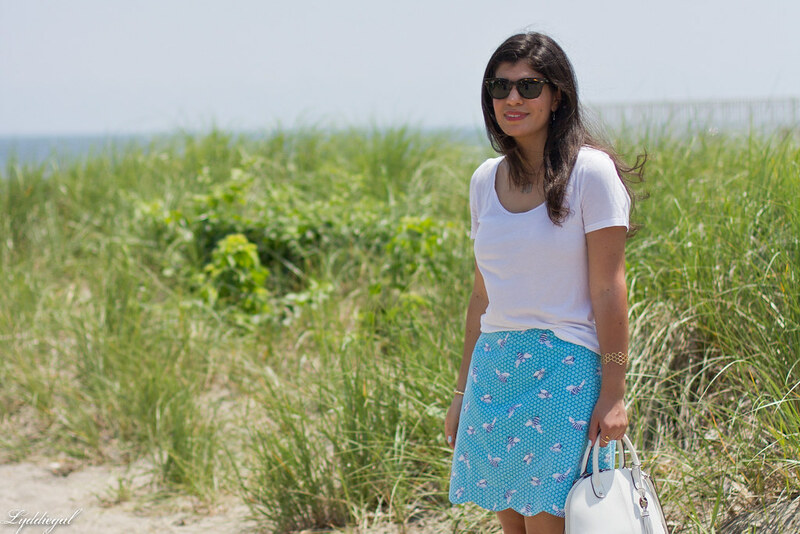 Lilly pieces are so quintessentially summer - that skirt is adorable! I don't own any LP items (not sure it's my style) but this skirt is so fun and more my style than the traditional prints. I love that your bracelet sort of reminds me of honeycombs too! Ughhhh don't get me started on Lilly x Target. I can't even. Love that skirt! So adorable! What a score on that skirt! I love the scalloped hem! Your patience paid off--that's such a pretty piece too! The real deal is way better than paying way too much for a Target piece (not that I don't love me some Target)! How adorable is that skirt?! Obsessing over the bee print and I wish my toes were in the sand right now! such a darling skirt! I love the fun print! darling photos! 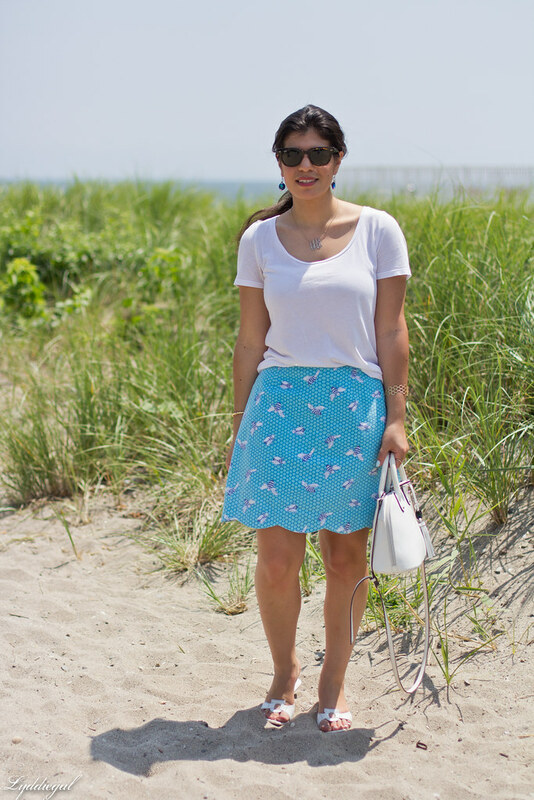 That skirt is gorgeous and so much fun, so glad you came across it! And that necklace was from Nasty Gal! It's not on their website anymore, sadly, but there might be some similar stuff. 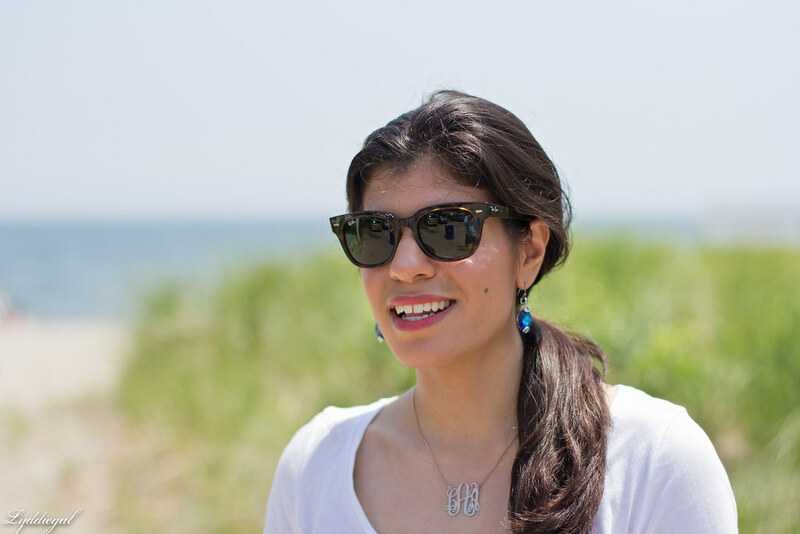 Aaaaaand those sunnies from your last post--I always admre how well you can style those. Phew. Have a good Friday, Miss Lydia! Pretty skirt, love the color! I didn't even try to go to Target that day, ha! Serendipity & Grace Jewelry Giveaway!